The recent months of 2011 have marked the manifestation of student frustration with the Chilean education system. Hundreds of thousands of university and secondary students have flooded the streets of Santiago and other cities across Chile, in a series of protests demanding: lower tuition, more opportunities to access public universities, better quality education, and increased government spending on education, including more scholarships for lower class students. The Chilean government spends less on education than most developed countries: 4.4% of its GDP, compared to the average 7%, which means a good portion of Chilean students pay for their own university education. With the combination of being one of the most socially stratified countries in the world, (40% of the country’s wealth is concentrated in 10% of the population), and the high costs of education, many students do not have the ability to attend a quality university. The Piñera administration and the leading group of Chilean students, along with their supporters have been at odds with each other for the last few months, struggling on the debate of education policy reform. Unable to agree upon a solution, the result has been the eruption of student protests across the country. These protests have been covered by media outlets worldwide, often featuring negative images of the few individuals who cause trouble. Most media attention focuses on people fighting with each other, and with the police, showing the resulting arrests and damage to public property. While this is one characteristic of the protests, there is another side of the story that isn’t always covered by the media. That side is of the great majority of the participants in the protest; the individual citizen, who is marching peacefully to show their concern for the issue at hand. As an organization, we do not take sides on political issues of this nature, however, we support a citizen’s right to express their content or discontent with their government. In this context, and for the purpose of encouraging civic engagement through information technology, Fundación Ciudadano Inteligente, (Smart Citizen Foundation, http://www.votainteligente.cl/) along with MIT’s Public Laboratory’s, adapted the idea of balloon mapping to our own needs. We wanted to demonstrate and strengthen the perspective of viewing protests from the citizen’s point of view, in order to broadcast to the world the majority, rather than the minority of the behavior of the attendees these events. We wanted to show a grassroots movement from a truly grassroots perspective. The objective was to cover the student protests in a way that was inexpensive, and easily replicable by almost anyone. The materials were simple: an iPhone 3G connected to the internet, string, helium, and balloons. We used a string to connect the camera phone and balloons, which were elevated to approximately 20 feet in the air, and controlled by a member of our team. The phone was connected to the internet, which allowed us to live stream the protest on our website. In only two hours, we had an incredible following; over 10,000 people viewed the protest live from our site, and Fundación Ciudadano Inteligente’s twitter account had thousands of hits and comments. This far exceeded the number of daily visits that we have on our website and showed the impact that this project could really have. 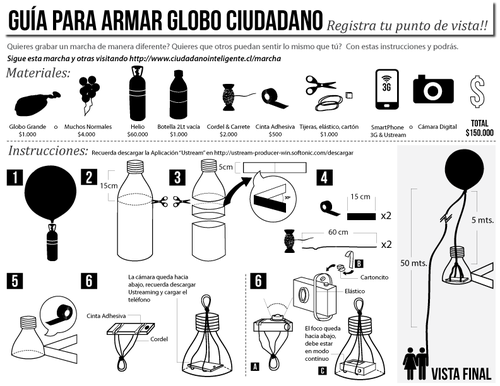 Approximately one week later, in preparation for the next round student protests, Fundación Ciudadano Inteligente translated the Public Laboratory’s Guide to Balloon Mapping into Spanish. We uploaded it onto our website, (http://www.ciudadanointeligente.cl/marcha/armatuglobo.html) as well as handed it out to demonstrators at the protest. We wanted to encourage Chilean citizens to construct their own balloon map, allowing them to show their own point of view of the protests. The reception to this idea was very positive and people were excited to realize that they could broadcast their own aerial view of the protest, with any webcam, or camera connected to the internet. This new idea also captured the attention of the media. Within the two weeks of live streaming the event, Ciudadano Inteligente was featured on Teletrece and TVN, both Chilean news stations that broadcast nationwide. We also had several radio station interviews on the topic. Much to the credit of the incredible citizen and media reception of this project, this site is now an extension of Fundación Cuidadano Inteligente, (http://www.ciudadanointeligente.cl/marcha/) that we hope to use to live stream future protests. We live in a world where connectivity is immediate and the potential for video virility is one tweet, or one post away. In the instance of balloon mapping protests, the fact that any handheld webcam, or phone with internet connection can be used to capture protests live, allows for the potential of thousands of views, and thus increasing the power of individual self expression and citizen engagement. Now ordinary people don’t necessarily have to rely solely on media broadcasting for coverage of a protest. This enables them not only to see the peaceful activity of the majority of the demonstration participants, but to show their own version of it to the world. This use of global mapping can truly put the power of the dispersion of visual information in the hands of everyday people, the majority of people, to show the positive and peaceful side of grassroots movements as they are happening. We hope that because of the nature of the feasibility of construction of the Balloon Mapping, for these purposes, more people will construct their own in the future. All of this can be done with easily accessible materials that almost anyone, almost anywhere, can find, allowing for the transformation of the perception of protests; from a literal top down, to bottom up, approach. In future demonstrations, we hope to look up and see a rainbow of balloons dotting the sky!